A guide to the best web browser for iPhone for those in possession of an iPhone or an iPad and want to surf the internet with the most High quality in circulation. The best Safari alternatives. Connect to the Internet has become a primary need. Users not only want to connect from laptop or PC, but also in mobility. Who uses iPhone or iPad can use the browser that comes pre-installed in the operating system. Safari has enough options to satisfy the users, and the version for iOS 8 brings the option of extension or the interactions of third-party applications. It is, obviously another plus for the browser from Apple. Many users, however, are not satisfied with this program and are looking for other software. We, therefore, identified (in our opinion) the best iPhone browser apps that deserve to be installed on your beloved iOS devices. Discover them below. Google Chrome is an excellent browser to surf the internet without too many complications. Google brings all the options and advantage of its desktop version for iOS users. Some notable features are sync tabs and bookmarks, integration with their applications many more possibilities. It has a very simple interface and easy to navigate. It also gives you the ability to visit sites and blogs without a trace (Navigation in Incognito). It is the best Safari alternative. Mercury Web Browser is the fastest browser app to surf the internet. It stands out for its synchronization with Firefox and Chrome, integration with Dropbox and its customization possibilities. Other notable features are themes, downloading, printing, file sharing, ad blocking, tabbed, multi-touch gestures, switching user account, private browsing and more. The Dolphin web browser is the first browser to introduce mobile navigation gestures. Dolphin is a great mobile browser that needs to be tested! It is a very powerful browser app for smartphone users. It supports gestures, printers, has a fullscreen mode, a brightness control, etc. If you do not know it, test it, it is worth it. The mobile version of Opera is also available in iOS, so you can enjoy this alternative browser that offers high speed, rapid access to your favorite connections, tabs with preview and other options for storing and sharing pages. Maxthon Cloud Browser is extremely a fast, secure and easy to use web browser app! The load times of pages are really remarkable, and the performance is really good. It also has download manager, private browsing, and support for tabs. These are the best browser for iOS. 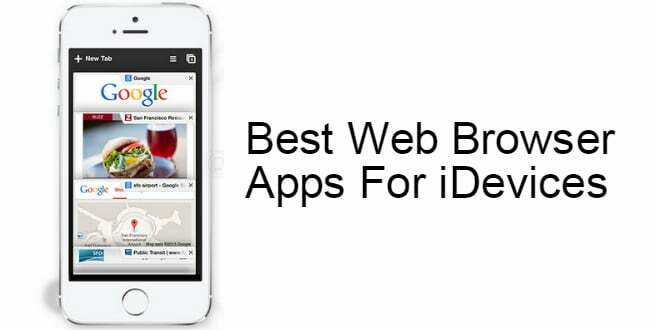 There are many other browsers, but certainly these apps deserve special attention. But for you, what are the best browsers for iOS? Share them in the comments and help us to complete this article. Have a nice day.